On June 12, in the Ishimine district of Shuri, Naha, Shinkichi Kinjo looks back on his memory with photographs of the past champions hanging in the Winner Boxing Gym. (Photograph taken by Masatoshi Moromizato). Kinjo was a boxer at Southern Agricultural and Forestry High School and Nihon University. He worked as the manager of the boxing club at Konan High School for 29 years from 1969 and at Okinawa Shogaku High School after that. He produced many national champions in invitational tournaments, inter-school championships and national sports festivals. Kinjo taught the fundamentals to many boxers who turned professional and became champions both inside and outside of Japan. They include Yoko Gushiken who was WBA Light Flyweight champion from 1976 to 1981 and Akinobu Hiranaka who won the WBA Light Welterweight title in 1992. Kinjo put in his own money to make the gym by renovating his house. Working with his wife, Kiyoko, who died three years ago, Kinjo has supported many boxers in the pursuit of their dream. 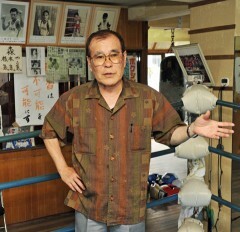 Boxers from outside Okinawa came to seek coaching from Kinjo and he often let them train in his gym. Kinjo decided to close his gym because it provides a venue for practice for Okinawa Shogaku High School, which will wind up its boxing club this year. Soon to turn 70 years old, he said that his advancing age is another reason behind his decision. Kinjo will continue to work for boxing. He has been the manager of the Toyo University Boxing Club since 2011 and works for the Okinawa Prefectural Boxing League. He said, “I am still passionate about boxing and love the sport.” Many people honor Kinjo by referring to him as the likes of “a legendary trainer,” “a fierce trainer” and “a smart trainer.” Sixty-eight-year-old Kinjo still keeps a close eye on the sport.